Tee, with Angel Wings! 100% of the proceeds benefit both the film and the environment. My name is Antonio Saillant, a graduate from New York Institute of Technology and CEO of Angel Light Communications and Dream Destinations LLC and I am dedicated to sustainable filmmaking. 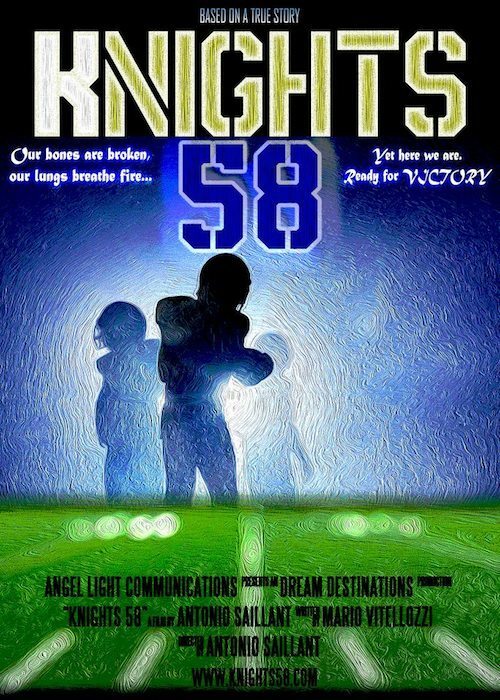 I am announcing that our film, Knights "58", currently in pre-production and scheduled for production in 2018/2019, in Old Tappan, New Jersey will be produced 100% sustainable. With this amazing campaign, you will be helping us, the world, spread green awareness and at the same time support our film by simply wearing our shirts. Knights "58" is a movie about the 1979 Old Tappan football team which tells the tale of how a losing [team] began to [turn that streak around and] sow the first seeds of promise and pride in the school and surrounding towns. “The whole turning point of the Knights was then,” which my older brother Angel was on the 1979 team. “[After a very long losing streak] they started being successful and then they won states in 1985, and the journey continues. ”People always asked, “How does a film company go green?” Well, it is the wave of the future- and it is cost effective. That’s an incentive, and it is also just good common sense. The basis of going green for the movies is to develop a recycling and conservation plan. All vendors must have a green certification. Make sure that all vendors recycle, use local products, and conserve energy. Change the way you dispose of bottled water, paper, and food products. Rent electronic equipment instead of buying-copy machines. Reuse equipment instead of purchasing it. Shut it all down when you’re not using it. Turn off the lights and turn off monitors. Fortunately, HD is digital not film. Therefore, it’s already green. My mission is to film the Knights "58" 100% sustainable and spread awareness worldwide throughout the film and sports industry, in hopes that, we all can do our part in the global race to prevent climate catastrophe. Being a leading voice for energy policy to protect the quality of life, I am truly dedicated to tackle our region's energy challenges and harness the economic opportunities presented by clean renewable energy. With your help and support, I can complete this amazing mission. Cinema has always held a very important place in my life. I seek inspiration in film, theatre, music, art - and in watching other filmmakers create a masterpiece from just an idea but for me, why not green? I will strive to create a positive message to people all over the world with industry-relevant information, tools, and strategies to support a Green Planet.